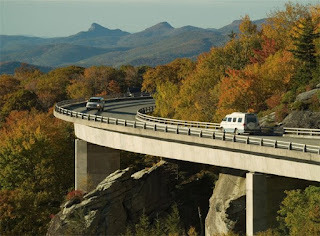 Driving along the Blue Ridge Parkway is a favorite activity for many people who come to Western North Carolina. Hiking, checking out Grandfather Mountain, Linville Falls, and the Orchard at Altapass, shopping in the little towns along the Parkway, and taking in beautiful high elevation views of forests and wildflowers make it popular with guests of the Inn. Milepost 367.6 to 355.3 – Asheville Area. 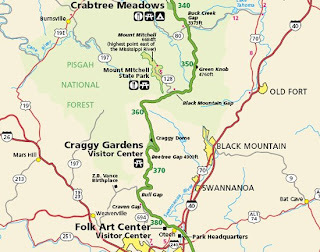 A rockslide and roadway failure has closed the Parkway to all activities including foot traffic and bicycling between the entrance to Craggy Gardens Picnic Area and the entrance to Mt. Mitchell State Park. The picnic area is accessible driving north from the Asheville area and the state park is accessible via the NC Highway 80 entrance to the Parkway. This road closure will remain in effect until late spring 2009. If you plan to head up to Mount Mitchell or points north, there are a couple of scenic detours from the Inn on Mill Creek. One, mentioned above, is Hwy 80. You can reach Hwy 80 from the Inn by taking Mill Creek Road to Hwy 70 into Old Fort. From there, you can pick up Hwy 80. The second route is to take Hwy 70 (or I-40) to 221, which will take you northward toward Linville Falls and Grandfather Mountain. This entry was posted in Uncategorized and tagged Blue Ridge Parkway by Inn on Mill Creek. Bookmark the permalink.